To help you do just that, I have put together a month long financial boot camp, with one or two tips per week and a call to action. Together, we will review several aspects of your financial life to make sure you start the year in good shape. Then, we talked about how you can reduce one of your biggest expense: your mortgage. Today, let’s tackle another living expense, your council tax. You can easily check online how much your neighbors are paying, in your street or your building. For terraced houses, since most houses are pretty similar, it is quite easy to compare and confirm if you are paying too much. 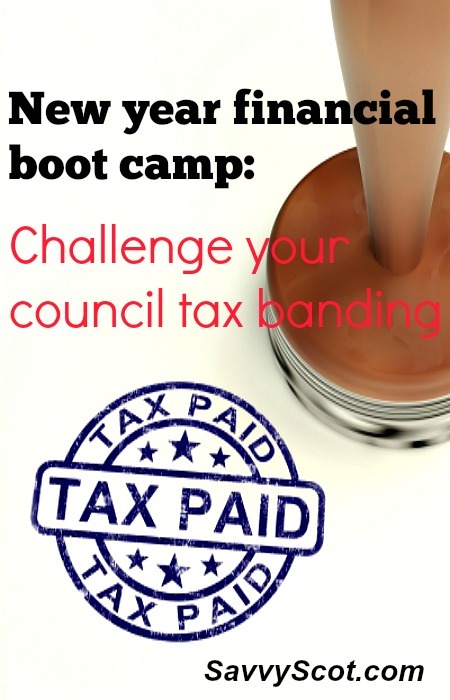 Challenging your council tax banding, how is it done? When I bought my property, it was brand new, and there were few sold flats around, but the building company told me to expect band C. What was my surprise when I received a Band E council tax bill! Immediately, I went online and looked up my neighbors. Most of them had similar sized property, except that I had three small rooms and they had two big ones. They were all band C. I wrote to the council and was adjusted to band D. Not quite the outcome I was expecting, but still a good £200 saved per year. It took one letter four years ago, the return on time invested is really worth the try. WARNING!! If you challenge your council tax banding, there are three outcomes. You can be adjusted down, like I was, if the council considers you are being charged more than comparable houses in your neighborhood. You can remain where you are, if they think that is where you belong. AND, if they think you should be charged more, they can upgrade your banding and you can’t ask them to undo it. Meaning you would start paying more. So be careful and only challenge it if you think you have a good case. I thought my case was pretty solid so I decided to give it a try. Here is the letter I wrote, together with floor plans, surfaces, selling price and council tax banding of my neighbors (all public information you can find easily). If you are a tenant do not do it unless you have your landlord’s approval, as the result will reflect on the property even when you move out. I recently bought/have lived at address since date, and am currently under council tax band X. I am writing to you today to ask you to reconsider and lower my banding to Y.
which you can see are all under council tax band Y.
I think it took a month or so to get a positive reply, but the new banding was retroactive, so if you have lived at the address for a while, not only is it not too late, you can save thousands by challenging your council tax banding! How likely is it to be in the wrong band? There is a good chance, as the council tax valuation is based on your house value several decades ago. Check out your neighbors to make a better guess. About £200 per band per year, then again it is a very local information, look online for your council’s detailed information. There is also a 25% discount on your council tax if you live alone. If you are studying full time, or are on benefits, you can ask for a full exemption. And if you can prove that this is a secondary house that is only occupied part of the year, you can ask for a discount as well. 1. Go online and compare your banding to your neighbors’. Look at houses you know are comparable in size and value. If several of them have a lower banding, you have a good chance of making your claim. 2. Write to the council. Using the template above. Attach as much information as possible about the comparable properties with lower banding. It will take you 30 minutes or less to check out your neighbors. It took me a couple more hours to compile as much data as possible, and a stamp to send it over. I am saving £200 a year, and have for the past 4 years. Pretty good for three hours of your time, what do you think? Good luck! I’ve actually had success challenging my Council Tax bills in the past and appreciate this round-up. A key thing is to keep at it too if you’re sure you’re overpaying. I got a letter back first time dismissing my claim – then when I followed that one up, addressing their points they agreed that I was overpaying. As with many money matters, perseverance pays off!